I have heard some storied about using Twitter as a tool for better customer service because more and more financial companies such as banks, credit card issuers and brokerages are using social media to reach out to existing and potential customers. Those stories, though seem real, I had no personal experience since I don’t have many issues with banks or credit card companies and and Twitter is only a tool that I use to get information and connect with other people. 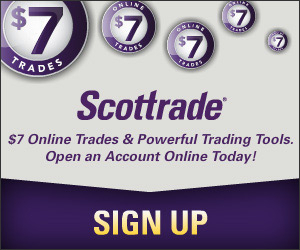 However, after my recent experience with Scottrade, my perception has changed. At the end of April, I wrote about withdrawing money from Scottrade brokerage account for the first time. Since I opted to withdraw the proceeds using checks and debit card instead of requesting a check from Scottrade, the whole process took a little bit longer to complete. The first set of 50 checks, which are from Scottrade, arrived nearly three weeks after I submitted my request on May 18th. But that wasn’t the end of it. It was only the good news. The bad news was that while examining the checks, I noticed that my name printed on the checks was wrong, which means that I can’t use it even though I only plan to write checks to myself so I can deposit the money into my bank account. Even though I wasn’t really in a rush to use the money, the fact that I may have to go through the process again due to the error was somewhat troubling. The next day, I tweeted this from my Twitter account to Scottrade. Checks from @scottrade arrived yesterday But the name printed on the check was mis-spelled Hate having to go through the process again. I was only trying to tell Scottrade what happened to the checks I ordered and didn’t really expect anything from Scottrade as I planed to give them a call later. About two hours after the tweet, I got an email from Scottrade, asking me to call the branch manager in my area, without saying what the matter was. I called and the manager, whom I talked with a few times in the past, first apologized for the error in the check. Then he said he will re-order the checks for me and as a compensation for the error, I will also receive 3 Scottrade free trades. When I got home that day, there was also a message left my my machine from the branch manager. Two days later, I received the checks in express mail and everything was correct. I have written in the past about Scottrade customer service, which I have been quite happy with since becoming a customer. The speedy handling of the checks only adds to my positive experience with the broker.